Focused, fast, precise, and purposeful… that is how the Cruise Missile arrives. There is no mistaking it. It does not bend its will. Pulling from this ethos the new Speed & Strength Cruise Missile collection hits the market with many of the same traits. With the first step into the line the new Speed and Strength Cruise Missile Boots make their statement with authority; they are a no-nonsense shoe for a no-drama rider. The kind of boots you would kick one of those swinging saloon doors open with before you and your burly mustache ran the table with your mad poker skills. With a premium leather upper and molded internal toe and ankle reinforcements it would certainly be at home in such a scenario. 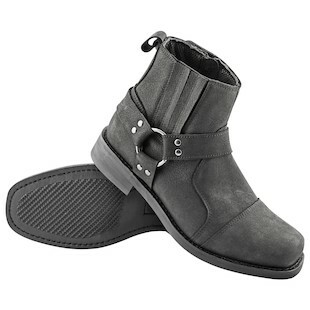 At the same time a dedicated side zipper entry, anti-slip rubber outsole, and reinforced toe shifter pad augment the moto functionality of this wide fitting boot. 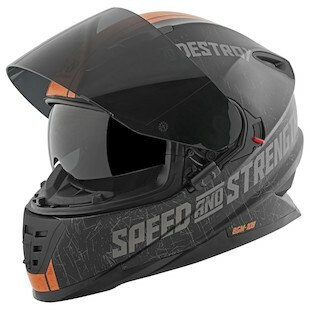 The Speed and Strength SS1600 Cruise Missile Helmet is cut from the same proverbial cloth and combines an advanced thermo-poly alloy shell with the Airstrike direct course ventilation system for a protective, comfortable, well-ventilated ride. Features such as the Lockdown shield security system offer advanced functionality for those times when your attack reaches a speedy velocity and an internal drop down sun visor can be employed on rides that span long hours through various lighting conditions. In meeting both DOT and ECE 22-05 standards it is heavy on features, high on protection, and competitively priced. The Cruise Missile does not mess around. Once it is on its way it needs no fanfare or fluff, just a mission. If you are the kind of rider who operates the same way, keep an eye on the new line from Speed and Strength as it takes off.